ABSTRACT: We studied benthic foraminifer and ostracod faunas from the Southwestern coasts of Antalya (Turkey) in 227 sediment samples collected by SCUBA divers in July and August, 2002. We identified 50 foraminifer genera and 96 species, some of which contained numerous large specimens. The large abundances of Indo-Pacific species, such as Peneroplis arietinus (Batsch), Amphisorus hemprichii Ehrenberg, Sorites variabilis Lacroix, Amphistegina lobifera Larsen, and Heterostegina depressa d’Orbigny is noteworthy. In some samples 75% of the sand is composed of Amphistegina lobifera Larsen tests. 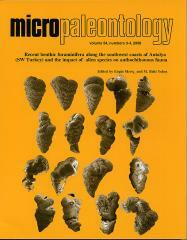 In contrast to this rich foraminifer fauna, ostracods are poorly represented by only 21 genera and 23 species.